Empower Women & Girls Today! When I had a daughter, one of my goals when raising her was to make sure to she was raised to be confident, passionate and brave in all she does. In this world, it can be hard to raise girls and women to be these things. Honestly, I am really scared for my little girl to grow up into an adolescent and face the cruelties of this world that may lower her self-esteem, make her insecure or even make her start to hate the body God has given her. Sometimes I feel really lost and scared to face that as a parent. But I feel a lot more hope and guided lately for raising my daughter to be the strong, confident woman I want her to be because I now have the book, Brave Girls: Raising Young Women with Passion and Purpose to Become Powerful Leaders by Stacey Radin to help guide me in this scary but rewarding journey of parenting girls. This book was so interesting, insightful and helpful guiding me and helping me start to parent and talk to my daughter the best way I can and to empower her and make her brave in this scary and cruel world. 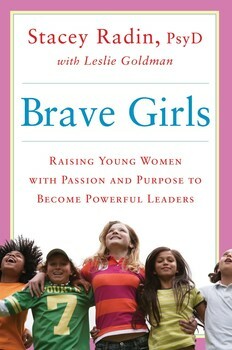 This book is the story and the science behind raising young women with passion and purpose. It was so interesting to learn that after interviewing hundreds of high-achieving businesswomen, Dr. Radin discovered that even the country's most accomplished female professionals were often hampered by insecurity and afraid of being considered too aggressive in a business world run largely by men. She breaks this book up into chapters focusing on different aspects of power and talks about real girl and women issues that we faced and will face. Any girl that reads this book will find ways to unleash her inner power and find her passion and women who read this book will find ways to empower girls and young women to be the best they can be and be change makers in our world today! I think in the world we live in where there are "mean girls", eating disorders, gender inequality and so much more, this is a powerful book for all women and girls to read! In addition to this great book, Dr. Radin also founded Unleashed, an after-school program that introduces pre-teen girls to an important social cause—animal rescue—and gives them a passion, a key element in being engaged and successful in both the workplace and in life. While the girls create solutions to the task of rescuing neglected and abused dogs, they learn compassion and resilience, how to interact with peers with empathy and respect, and develop resourcefulness and critical thinking skills. Founded in 2010 by psychologist and leadership consultant Dr. Stacey Radin (Psy.D), Unleashed is a twelve-week after-school program currently in place in fifteen schools & three community centers in the U.S. To date they have served over 300 girls, rescued over 400 puppies, and run 24 programs in more than 15 schools. The program seeks to "revolutionize gender in our society" by teaching pre-teen girls to take charge in the goal of dog rescue. By becoming experts in animal rights and welfare, Dr. Radin coaches girls to think big, collaborate, and discover and exercise their power to make a difference in society and take a stand against injustice. It sounds like a great program and you can get involved today helping girls for empowering and teaching compassion and resourcefulness for pre-teen girls! Just head over to the Unleased website today to see how YOU make a difference!